Peter Sloterdijk turns his keen eye to the history of western thought, conducting colorful readings of the lives and ideas of the world’s most influential intellectuals. Featuring nineteen vignettes rich in personal characterizations and theoretical analysis, Sloterdijk’s companionable volume casts the development of philosophical thinking not as a buildup of compelling books and arguments but as a lifelong, intimate struggle with intellectual and spiritual movements, filled with as many pitfalls and derailments as transcendent breakthroughs. Sloterdijk delves into the work and times of Aristotle, Augustine, Bruno, Descartes, Foucault, Fichte, Hegel, Husserl, Kant, Kierkegaard, Leibniz, Marx, Nietzsche, Pascal, Plato, Sartre, Schelling, Schopenhauer, and Wittgenstein. 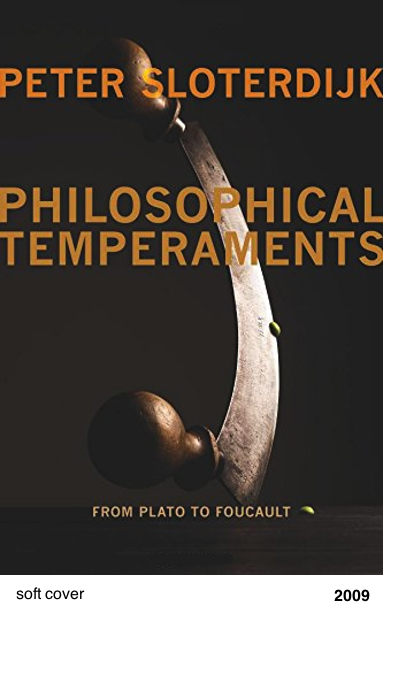 He provocatively juxtaposes Plato against shamanism and Marx against Gnosticism, revealing both the vital external influences shaping these intellectuals‘ thought and the excitement and wonder generated by the application of their thinking in the real world. The philosophical „temperament“ as conceived by Sloterdijk represents the uniquely creative encounter between the mind and a diverse array of cultures. It marks these philosophers‘ singular achievements and the special dynamic at play in philosophy as a whole. Creston Davis’s introduction details Sloterdijk’s own temperament, surveying the celebrated thinker’s intellectual context, rhetorical style, and philosophical persona.